Coinbase has been quite active and announcing a lot of new features. Just this Thursday (15) the platform updated its cryptocurrency system with a new SMS-based solution. 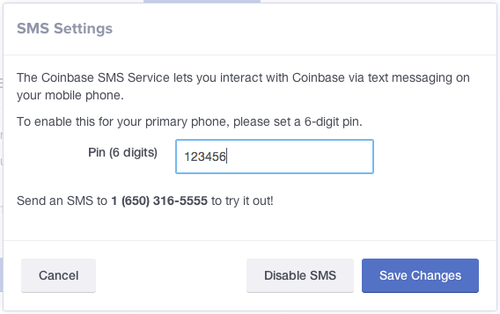 This means that Coinbase’s users can now perform all basic actions related to Bitcoin through short text messages and using simple commands. This feature works with any kind of smartphone or mobile device, allowing the users to enjoy all the perks of the service. “We are constantly trying to make Bitcoin easy and accessible to everyone. Some of the people who can benefit from Bitcoin the most (those in second and third world countries) don’t have a smartphone though”, explains Coinbase on their blog. So, what do you have to do to set up and use this new service? Firstly, go to the platform’s accounts page and then verify your phone number. As you can see, the SMS option is disabled by default. Click on the ‘SMS Settings’ button and set up your 6-digit pin. You can use the number 1 (650) 316-5555 to try this new feature. The pin will later be requested during a voice call that confirms the commands for transactions that affect your Bitcoin balance. To check the full list of commands you can click here.